Our Reference Guide is a great place to start looking for the right tree for the right place. Because of regional and local variables, choosing the best trees for your site can be challenging. Dozens of online resources present tree selection, planting and care guidelines. Some of our favorite regional and national sites are listed below. Our list recommends small stature, street tough and adaptable trees that are a perfect fit for under utility wires. Fact Sheets for trees developed at USNA and introduced to the nursery trade include Gold Medal and All America Selection winners. Site Assessment and Tree Selection for Stress Tolerance at Cornell University reveals that many trees developed at J. Frank Schmidt & Son Co. are suited for difficult planting sites and growing conditions. Each year, we send trees to Cornell for long-term evaluation. The NRCS PLANTS Database provides standardized information about the vascular plants, mosses, liverworts, hornworts, and lichens of the U.S. and its territories. It includes names, plant symbols, images, checklists by state and plant character, distributional data, species abstracts, crop information and more. A collection of databases that includes current plant and seed sources for 97,248 cultivated plants offered by1023 North American retail and wholesale seed and nursery firms, plus contact information for an additional 1000+ nurseries. Presented by the Andersen Horticultural Library, located at the Minnesota Landscape Arboretum, it includes links to regional sites with expert advice on growing plants. Richly illustrated and seriously simple search for plants and places to find them. Many of the trees trialed and recommended by the RHS are highly appropriate for North American gardens. Great gardening tips are found here, too. Leafsnap is the first in a series of electronic field guides being developed by researchers from Columbia University, the University of Maryland, and the Smithsonian Institution. Lots of work yet to be done, but this visual recognition software is already helpful in identifying tree species from photographs of their leaves. Go to the Apple App Store for free downloads for iPhone and iPad. A woody plants identification system and a pictorial guide to over 1,700 trees and shrubs is found on this information-rich site developed by the Oregon State University Department of Horticulture with the support of the Oregon Master Gardener Association and the J. Frank Schmidt Family Charitable Foundation. Learn about individual street and yard trees for the Portland, OR and Vancouver, WA metro area and beyond. Cool features include interactive graphics for each tree and cultivar that illustrate its growth rate and character over the next 60 years, and colorful symbols that denote the seasonal characteristics of each tree. An educational and public outreach program of the Elisabeth Carey Miller Botanical Garden located in Seattle, WA. Recommends more than 800 outstanding trees, shrubs and plants for gardens in the maritime Pacific Northwest. Lists 1,481 trees with up to 49 attributes and over 6,050 photos for 1,068 trees. Search by tree attribute or by name. Developed for California by the Urban Forest Ecosystems Institute (UFEI) at Cal Poly State University, it is useful throughout much of the West. Recommends more than 250 trees for Front Range landscapes. Colorado State University experts recommend several woody trees with year-round interest. Water-wise and other plants recommended by Colorado State University and the Denver Botanic Garden. 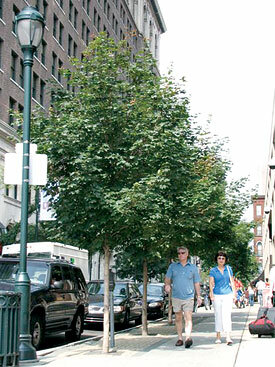 Urban trees recommended by experts at Utah State University. Tree management, gardening tips, pest and disease information and other information can be accessed from this link. The North Dakota Tree Handbook suggests appropriate trees for Great Plains landscapes. UI Plants is a database on woody landscape plant identification, culture and usage for the Midwest, including native and introduced species and their major varieties and cultivars. Top-performing trees, shrubs and other plants recommended by staff of the Chicago Botanic Garden. J. Frank Schmidt & Son Co. is a licensed grower of many of the introductions of this innovative plant program. Focus is to promote the use of new plant cultivars that are well adapted to the growing conditions of the Upper Midwest and other areas with similar growing conditions. Includes a searchable database of high quality images featuring ornamental plants, turf, fruits and vegetables, plant diseases, insects and more. More than 800 gardening FAQ’s and answers, and 200 gardening videos are also found here. Plants of Merit® are selected for their outstanding quality and dependable performance for the lower Midwest. The Missouri Botanic Garden-sponsored program highlights plants that grow consistently well in Missouri, central and southern Illinois, and the Kansas City Metro area. Royal Raindrops® Crabapple is named a Plant of Merit for 2013! Look up, view a photo and read about 5,400+ plants growing or that have been grown in the Kemper Center for Home Gardening display gardens of the Missouri Botanic Garden. Lists of preferred trees for the four main growing regions of Kansas, and numerous downloadable booklets and fact sheets. Top-performing trees as recommended by a panel of metropolitan area experts including Chris Casebeer, JFS sales representative for the Lower Midwest, Texas and Eastern Plains. The Department of Horticulture and Landscape Architecture faculty at Oklahoma State University recommends plants adapted for use across Oklahoma. Recommendations of Texas A&M AgriLife Research & Extension. University of Kentucky site provides information on many of the common native trees found in Kentucky. Tree identification fact sheets are presented by Virginia Tech. Guidelines for site analysis, information about soil volume requirements, and a Virginia Urban Street Tree Selector are among the valuable tools on this site, tailored for mid-Atlantic cities and urban forest managers. Tree fact sheets and general information about plants, diseases, general gardening topics and Recommended Trees for Difficult Sites are found on this North Carolina State University site. Tree Selector allows you to develop a list of site-appropriate trees for USDA Zones 8-11 by choosing soil, site, and plant attributes. A selection guide created for tree planters and managers in USDA Hardiness Zones 2-7, helpful in creating a list of possible trees for planting in the northern United States. Dr. Jason Grabosky of Rutgers University worked with USFS and University of Florida’s Dr. Ed Gilman to develop this regional resource. Presented by the Urban Horticulture Institute at Cornell University, Ithaca, New York. Their Woody Plant Database assists tree planters in choosing site-appropriate trees for difficult planting sites including wet or dry soils, high or low pH, environmental or road salts, etc. Both sites are appropriate for use in regions across North America. Presented by the University of Rhode Island and the Rhode Island Agricultural Experiment Station. Recognizes outstanding plants for New England gardens. A program of the Pennsylvania Horticultural Society that recognizes outstanding garden plants for Zones 5-7. Listen to a plant pronunciation guide for each tree and take virtual plant walks on the University of Connecticut and other New England college campuses.